MANILA, Philippines - Vice President Jejomar Binay and Sen. Gringo Honasan were among the first to file for certificates of candidacy (CoC) on Monday, October 12, 2015 as UNA's presidential-vice-presidential tandem for the 2016 national elections. Binay and Honasan were accompanied by their family and supporters at the Comelec's first day of filing CoCs. Binay's children, Junjun and Nancy, and former Tarlac Governor Margarita Tingting Cojuangco witnessed their official bid. Binay is the first politician who declared his intention for the highest post for the 2016 polls. 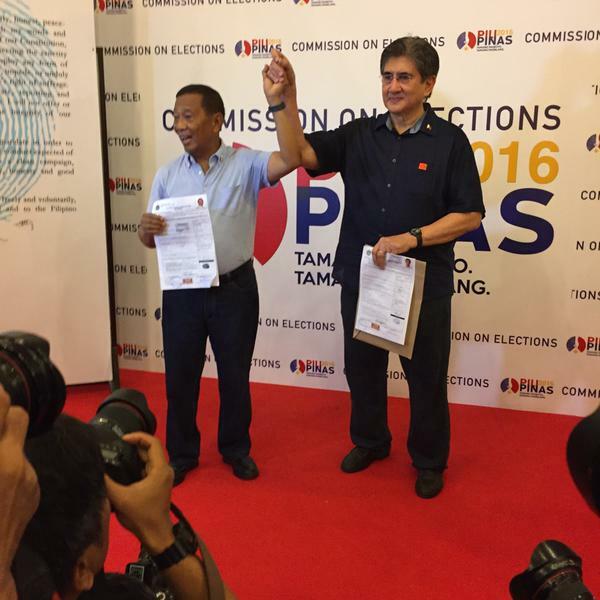 The search for his running-mate has ended as Honasan was chosen by UNA to be his tandem. Honasan was absent during the UNA launch event in Cebu last week but explained that he is not backing out from the race and he is just busy with his tasks of organizing UNA. The filing of CoCs would run from October 12 to October 16, Monday to Friday (this week).